Enjoy DVD movies on your palm with PSP? Let 4Media DVD to MP4 Converter makes it ture. As professional DVD to MP4 converting software, 4Media DVD to MP4 Converter can convert DVD to MP4 format for playing on many players. 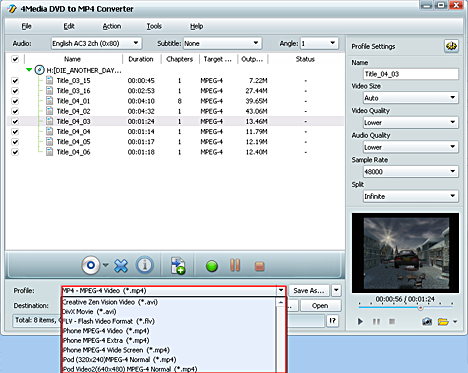 Converting DVD to PSP MP4 can be easily done with high speed and high quality. Let's see how to do it with the converter. Please download 4Media DVD to MP4 Converter first and it offers free trial. Then install it on your computer and launch it. 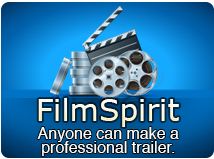 Open the "Profile" drop-down list and scroll to select the format. 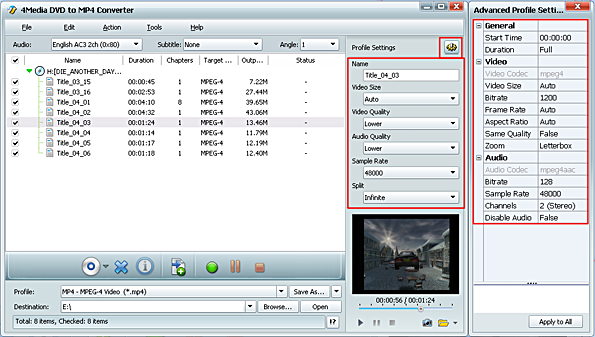 You can see the DVD to MP4 converter provides 6 PSP formats for your choice. Choose the format according to your need: general PSP MP4, PSP AVC MP4, Minimal PSP video, or excellent PSP MP4. If all the choices could not meet your need, you can change the default DVD audio, subtitle, and angle, Zoom mode for output format. And to further customize the videos by setting output video size, video quality, and channels in Advanced profile setting panel. When all settings finished, click the green "Convert" button to start the conversion. In a short while, you will see the "completed" status shows and this time you can just click the "open" button to check the target videos. Free download 4Media DVD to MP4 Converter, and enjoy the DVD movies with PSP wherever you go!